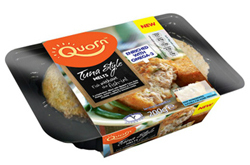 Quorn is extending its vegetarian range to include fish(less) lines. “Why hasn’t this been done before?” we hear you ask. Indeed, like all the best innovations this new product range seems like a no-brainer. The brand has created a family positioning for its meat-free ranges and the fish-free range is no different, although it does feel more premium. Quorn has successfully captured the imaginations of those with ethical concerns around over fishing or intensive farming – as well as being accessible to those who are trying to be a little bit healthier. Where will the Quorn brand will go next?